Management in itself is such a generic word with lots of different interpretation depending on who you are and what you're doing, or even thinking of for the time being. It needs to be put into some additional context. For management of businesses or parts of (whole business(es) - board of directors; CEO;..., markets, operations, or people; being a manager of [...]), check out a partner of ours at jandp.biz/bmcg - J&P Business Management Consulting Group. When talking details and specific functions, specific pieces of equipment, by people well familiar with details: the Network Management Layer in the TMN model (see below). Organization dedicated to operations systems support (OSS) communication management issues. 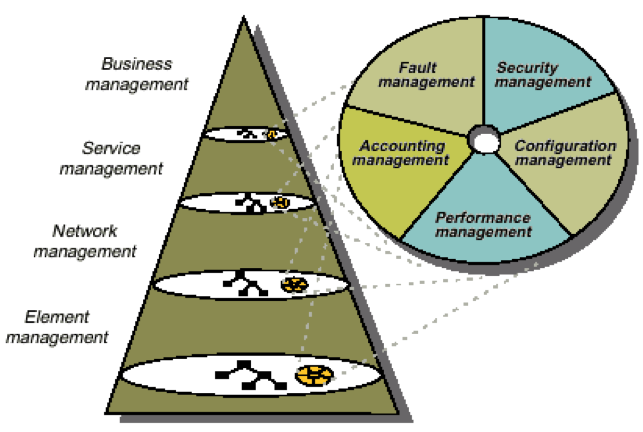 Just a few as example - there are zillions of element/network/service management solutions out there.